A gust of wind swirled the desert dust into a mini-tornado on a lake bed as I drove past Joshua trees in the interior of the Mojave. Wisps of cloud hung low in the distant horizon. A red-tailed hawk circled around a hill. I was enthralled by the immense space and tranquility, but my joy soon subsided when I saw old tires, broken chairs, jars, rusty soda cans, plastic bags strewn around and rags entangled in creosote bushes. I was squarely reminded that I was not too far from humans. The Mojave Desert, one of the smallest deserts in the world, has been the most cherished natural area of the Southwest. Despite the harsh environmental conditions, it teems with desert flora and fauna, many of which are highly endangered. Some of the prominent species are the coyote, desert fox, bighorn sheep, golden eagle, desert tortoise and jack rabbit, yet their habitats are increasingly being degraded due to illegal dumping of trash. People load their trucks with discarded household items and dump them indiscriminately in the desert, which not only spoils the scenic beauty but also harms desert plants and animals. Broken glasses can lacerate the feet of mammals like foxes and coyotes that roam the desert landscape. Small lizards can squeeze into bottles or cans to seek protection or search for food, but often find it difficult to get out and die of overheating. Toxic metals can adversely affect the cellular processes such as photosynthesis of many plants that have horizontal root systems just below the surface. High levels of toxic metals like lead and mercury are increasingly being reported in the tissues of wild animals like desert tortoises. Large predators like coyotes generally suffer more from metal toxicity due to bioaccumulation. Some people consider the desert a desiccated, barren land that in essence is useless wasteland. They should realize that the Mojave Desert provided ecosystem services to people for thousands of years, and continues to do so. Plants like mesquite, pinyon pine and oak have been crucial for the survival of Native Americans in the Mojave. In addition, there are innumerable water-stingy plants that have medicinal properties. For instance, creosote, an evergreen bush commonly found in the Mojave, is known to cure several gastrointestinal and respiratory ailments. There are probably scores of plants whose medicinal properties are yet to be discovered; antidotes for debilitating diseases with hitherto no cure might be hidden in the desert. Given these, destroying the Mojave Desert would be killing the goose that laid the golden eggs. We need to do all we can to conserve it for ourselves and for posterity. By restraining ourselves from trashing the desert, we will be sparing the lives of thousands of plants and animals that may be a unique genetic reservoir for our future food and medicine. Many things, like aluminum cans and plastic containers, that people cast away in the desert do not readily disintegrate and thus remain a threat to wild flora and fauna for decades. To maintain the integrity of the desert ecosystem, people also need to manage the garbage dumps in towns. Research worldwide has shown that populations of several predators get artificially inflated as a result of them feeding on these dumps. This has adverse effects on natural ecosystems: High numbers of these predators drive their natural prey to extinction. Studies in the Mojave have reported ravens threatening several endangered species, including the desert tortoise. The general public needs to be educated about these ecological ramifications; a clean-up drive is urgently needed in the short-term. Campers need to be strictly instructed and educated about the consequences of littering the campgrounds. Folks should be reminded that someone else might also like to camp there. 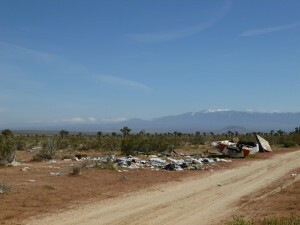 The governments of the three states that straddle the Mojave should clamp down on irresponsible campers and others who litter the natural areas. All the trash needs to be taken to a landfill or a recycling center.